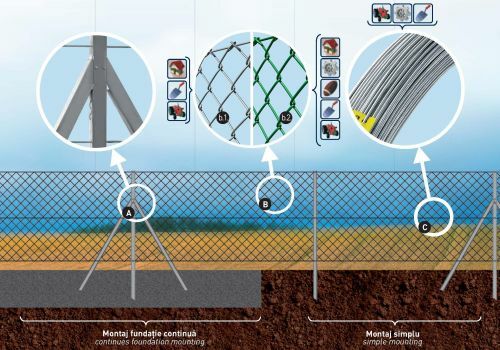 Fencing systems, manufactured by Metal Work Industry, made of metal poles and mesh, may be assembled independently for the perimeter delimitation, or may complete falready existing fences or walls. Due to the modular simple and functional structure, these can be easily set up, even by unprofessional personnel, and also they can be adjusted to match any landscape form, for a great variety of fences, such as: industrial, community, civil, sporting, military or even recreational area. The fencing systems are recommended for any form of landscape, even if rough land, with steep and slippery slopes.